A popular 7 day Greece itinerary combines time in Athens, Santorini and Mykonos. Here's a local's guide to planning the perfect Greece itinerary 7 days. People often ask how long they should stay in Greece for. My answer is as long as you can, as Greece has a lot more to offer than you think. I've lived here for nearly 5 years, and feel I've still barely scratched the surface! After setting up a design your own trip feature on the blog, I came to realise that a significant amount of people were requesting information for spending 7 days in Greece. I also noticed that the most popular combination, was the Athens – Santorini – Mykonos one. 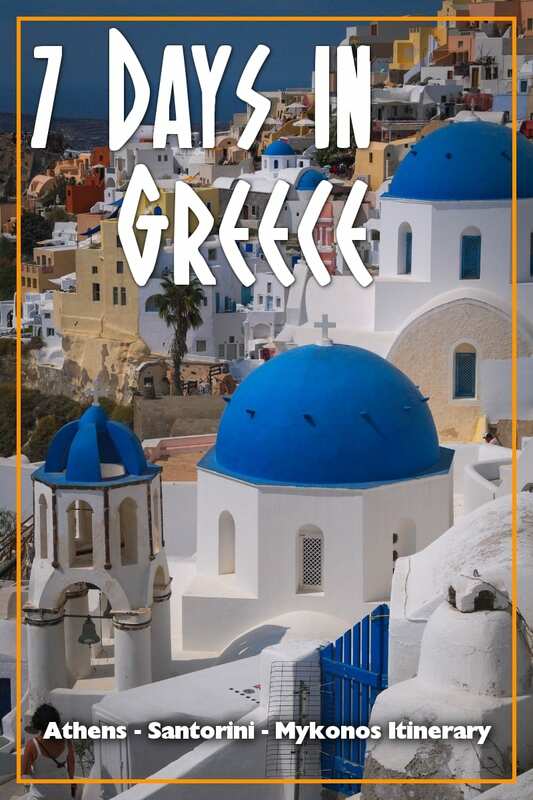 As a result, I created this Greece in 7 days itinerary to help people plan their Greek vacations. If this is your first time in Greece, it makes sense to go to the most famous destinations, i.e. Athens, Santorini and Mykonos. Keep in mind that these Greek destinations are quite popular. So, whilst you will be visiting well known and incredibly beautfiful places, Santorini and Mykonos in particular offer less of the ‘authentic' Greece. I've tried to create this Greece 1 week itinerary to minimise your travel time, and maximise your overall experience. It includes visits to ancient sites in Greece, beaches, and how to see the incredible Santorini sunset. First though, how should you get around? The logistics of travel between Greek islands in 7 days is something worthy of deeper consideration. Before you start planning your week in Greece, you should understand the logistics of travelling around Greece and the Greek islands. Greece has several groups of islands, most of them being in the Aegean Sea. Mykonos and Santorini both belong to a group called the Cyclades, and they are reasonably close to each other. As they are popular destinations, they each have an airport as well as a port. As such, whilst Greek island hopping by ferry is the ‘old way' to get around, flights are certainly an option. Santorini and Mykonos are connected by a number of boats, running on a daily basis. There are many types of boats, the fastest one taking just under 2 hours and the slowest one around 4 hours. If you only have seven days in Greece, time is important, so you might prefer to choose the fast boat. At the same time, the journey on the slower boat is generally more pleasant. Something to consider. Athens, the capital, is connected to both Santorini and Mykonos by flights as well as several types of boats departing from Pireaus or Rafina, the two ports close to Athens. It takes anything between 5 and 10 hours to get to Santorini on a boat, while getting to Mykonos takes anything from just over 2 hours to about 5 and a half hours. A flight from Athens to the islands and vice-versa will take you just under an hour. Is it best to fly or use the ferry? With all of the above in mind, if you are trying to plan your Greece itinerary for 7 days, your best bet is to spend less time getting from A to B, and more time enjoying the different places. 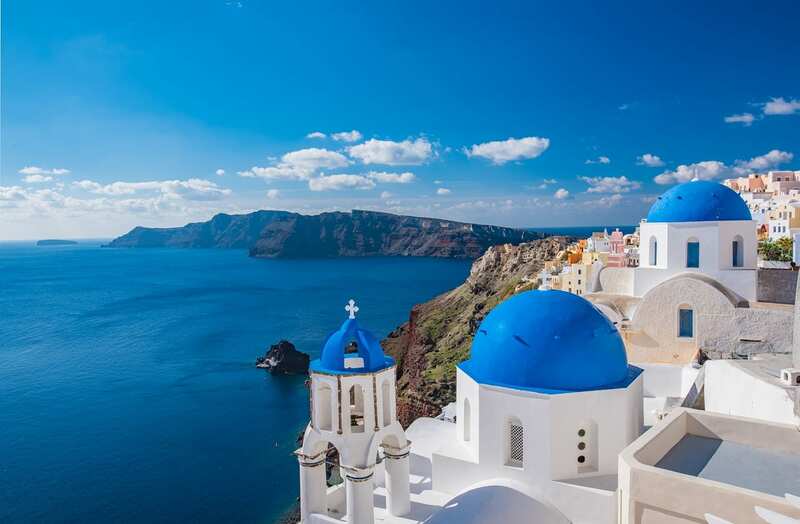 If you book well in advance, you can get good deals for flights to Mykonos and Santorini – in fact, some boat tickets are a lot more expensive than flights booked in advance. Unless you are arriving on a direct flight to Santorini or Mykonos, chances are that you will be landing in Athens. My suggestion is to find the next available flight to Mykonos or Santorini, whichever one suits best your budget and your timetable, and go to the first island straight away, leaving Athens as your last destination. This is so that you can have some time to unwind on the islands before hitting the capital. Also, there is the rare (but still possible) scenario of getting stuck on one of the islands because of bad weather or a last-minute boat strike. Athens > flight to Mykonos > 2 days in Mykonos > boat to Santorini > 2 days in Santorini > flight back to Athens > 3 days in Athens. If you want a more relaxed vacation, you could just choose two destinations, and skip either one of the islands or Athens. However most people seem to prefer to visit as much as they can in their Greece itinerary for 7 days. I don’t blame you! If I had to choose, I would marginally prefer to go to Mykonos before heading to Santorini. The reason being, that Mykonos is more geared towards beaches and nightlife, whereas Santorini has more to do in terms of day activities. 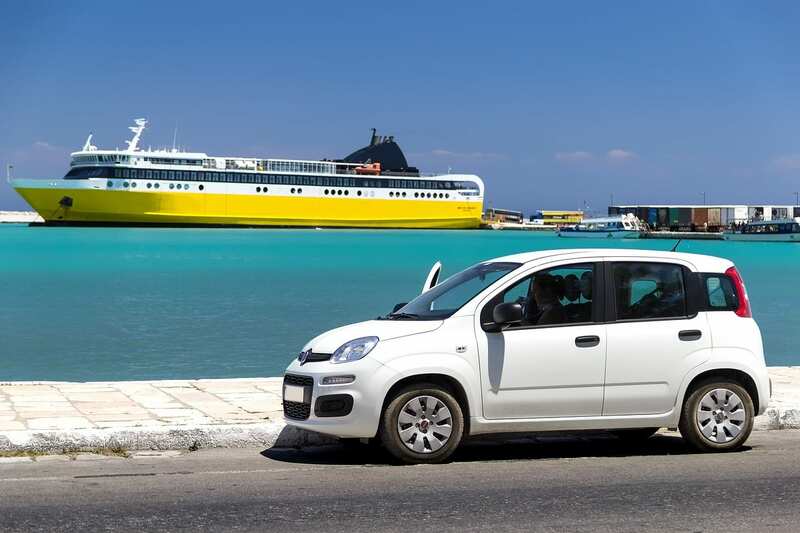 When in Mykonos, you can rent a car and go around the island, visiting the most famous beaches like Elia, Platis Gialos or Ornos. At night, there are several bars and clubs to choose from. Mykonos has been a party island for many decades, so they definitely know what they are doing! 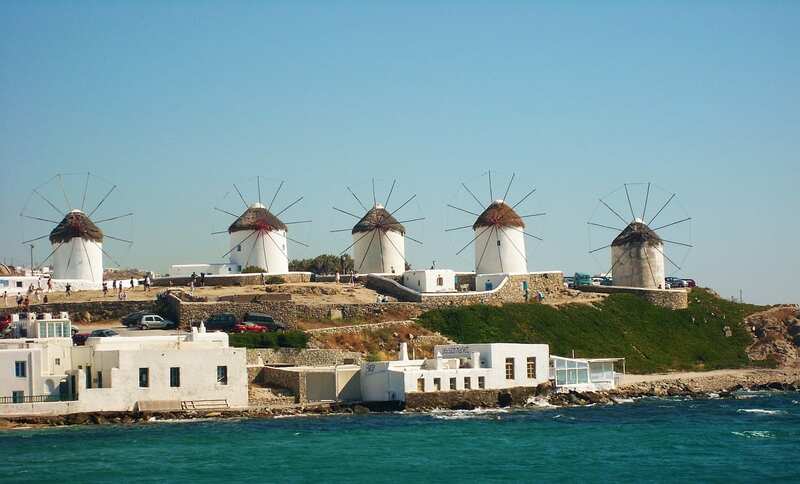 Check out this article to plan your 2 days in Mykonos – Fun things to do in Mykonos. From Mykonos, the best way to get to Santorini is by boat. A good website for checking out boat routes in Greece is www.ferryhopper.com. Note that if you are planning your trip many months in advance, the information isn’t always updated. Also, there are more boats during high season (June-August) than in low season, and it’s best to book your tickets early if your dates are fixed. Note that it is actually possible to fly from Mykonos to Santorini through Athens, but the boat trip makes more sense – and is more scenic. Santorini is world-famous, and for good reason. The white-washed houses and stunning sunsets would be enough on their own, but there are also winery tours, boat cruises around the island, and a visit to the volcano. The beaches in Santorini are not as nice as the ones in Mykonos, but you should still take time to put your feet up and get some sunshine. 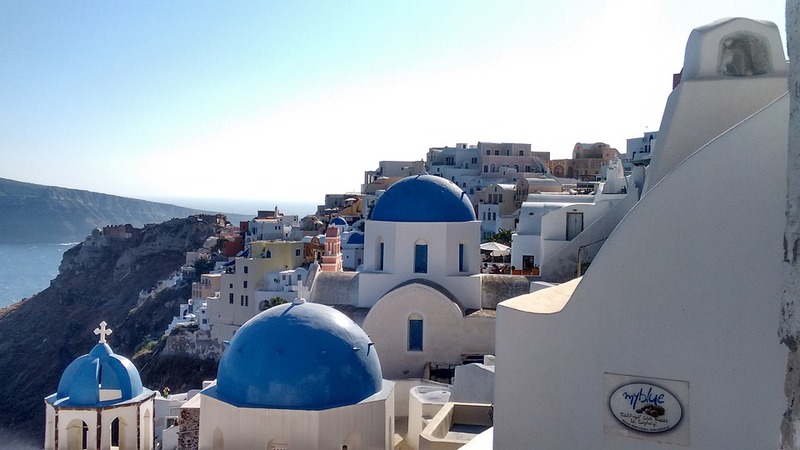 You can start planning your 2 days in Santorini here – Santorini 2 day Itinerary. If you wanted to stay a bit longer, I've also got a 3 Day Santorini itinerary. From Santorini, you can fly to Athens. If you are there in high season, book your tickets as early as possible, as they tend to go up in price closer to the time. Santorini’s airport is tiny, but it gets super crowded, so arrive with plenty of time. For information on how to get to and from Santorini, take a look here – Santorini Airport Transfers. With 7 days in Greece, staying in Athens for 3 days might sound a lot, however the capital has plenty to offer in terms of history, archaeology, museums, walks, as well as shopping, if that’s what you are into. However, some people might prefer to spend less time in Athens, and spend an extra night on one of the islands – it’s all up to what you are after so there is no “right” or “wrong” way of planning your 7 day itinerary in Greece. 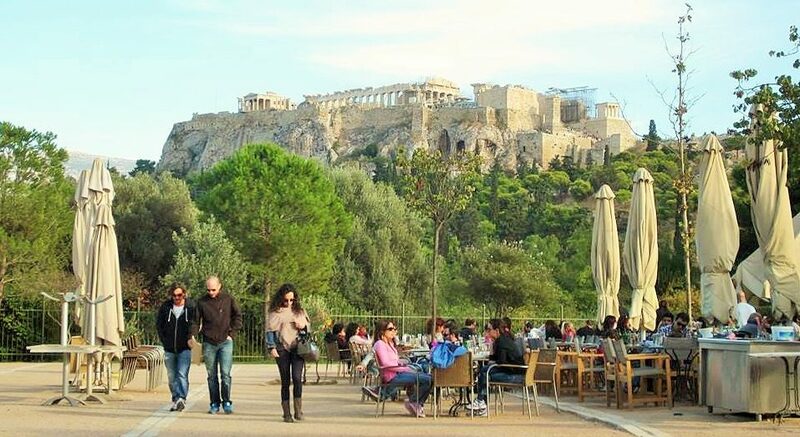 When you are in Athens, the obvious sights to see are the Acropolis, the Ancient Agora and the Acropolis Museum. While these can easily be done in just one day, I definitely do not recommend it if you want to do them justice. Other highlights in the capital include the Parliament and the change of the Guards at Syntagma Square, the National Archaeological Museum, the Benaki Museum, the food market, and a walk on Areopagitou Street. If you are lucky, you can also catch a performance in the Ancient Herodion theatre – check for tickets well in advance. Staying an extra day in Athens also gives you the option of taking a day tour. The most popular day trips from Athens include Delphi, Mycenae, and the Temple of Poseidon. Hopefully, the above information should give you a good start on planning your 7 day Greece itinerary. If you'd like more information on things to see and do in Greece, sign up for my free guides. I'll send you inside tips and useful insights into things to do in Greece, so you'll have the perfect vacation! If you are a Pinterest pinner, please add this one week in Greece pin to your boards! Hi Dave – help! We are 6 women (2 of Greek heritage) trying to plan a 2 week trip to Greece in October 2019. Initially our plan was to do Athens to Nafplios and use that as a day trip headquarters for 3 days. Mycenae, Epidavros and anything else in the area that we find out about. (originally I voted to go from Athens to Hydra and take a ferry to Ermoni and rent a car to go to Nafplio but some aren’t keen on that). Our second week would be spent in Gorani (the village where the 2 Greek’s father was born) and use that for day trips to Mystras, Monemvasia. (husbands would be joining for the second week). Now a couple of our group have suggested we go to Delphi and Meteora, which takes us in a completely different direction. Trying to make this all work out but we don’t seem to be making progress. Can you assist with what might make sense? (Some of us are staying a 3rd week to see some of the islands). Any help you could give is greatly appreciated. You’re right that Delphi and Meteora take you the wrong way, but Delphi could still be doable – it just depends how much travelling you want to do. For example, Delphi would make an easy day trip from Athens. Read more here – Delphi Day trip from Athens. If you are planning to rent a car in Athens, you could also do it yourselves. It might be a long day, but theoretically you could drive from Athens to Delphi, see Delphi, and then drive either back to Athens or to Nafplio the same (very long!!!) day. A combination of Delphi and Meteora as a 2 day trip is also available which might appeal to some of your group. Find more here – Delphi and Meteora.